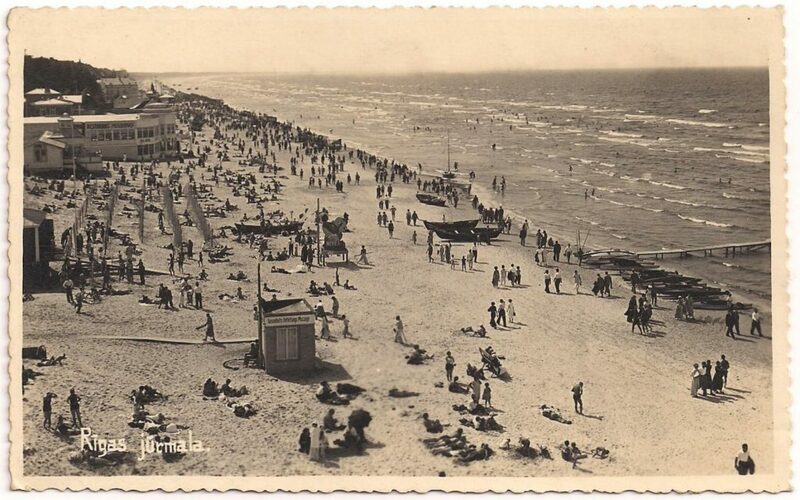 After the independence struggle, the guests have to return quickly to the Baltic Riviera. “Von der Gesamtzahl der Badegäste in Jahre 1921 sind ca ⅔ Hebräer.”, in 1921 about ⅔ are Jews. 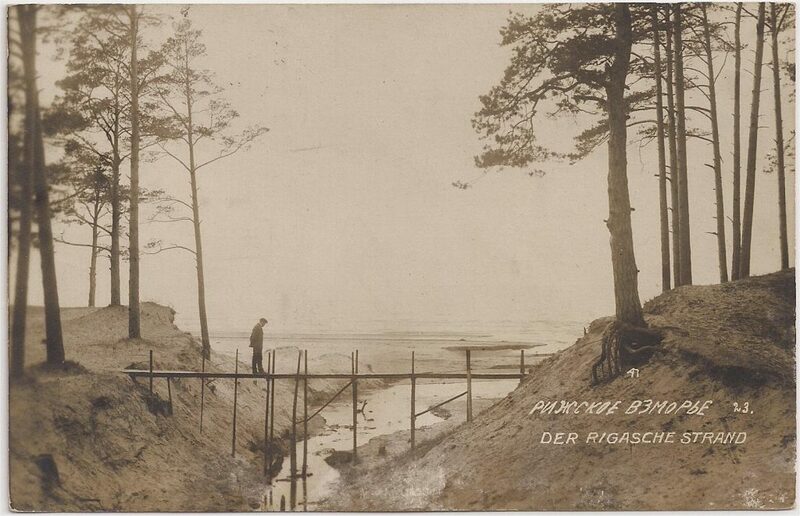 The Guide “Der Rigasche Strand” (The Riga Beach) -a little bit later in the Twenties (c. 1928) – speaks of 50 to 60.000 guests (10% foreigners).This is not yet the number of pre-war-120 000. From Riga to many trains ran during the summer, 36 to Rīgas Jūrmala and back daily. 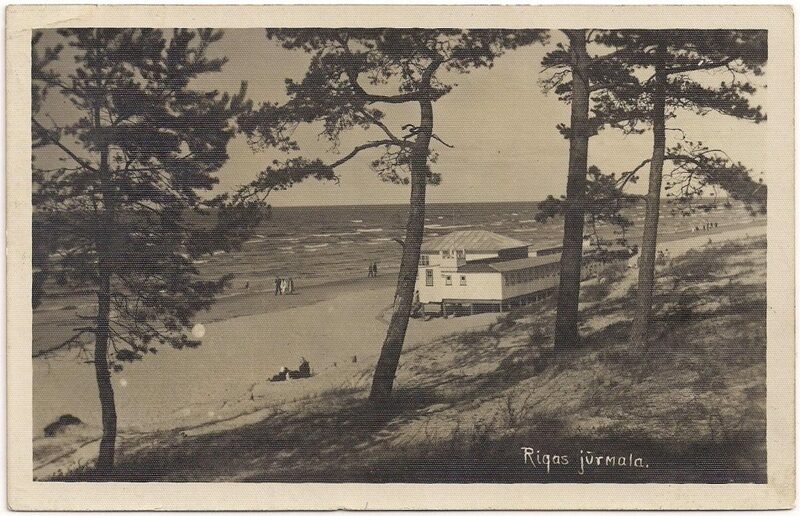 There was also a steamboat connection and a first class road between Riga and the beach. Card, sent from Bulduri to Germany. 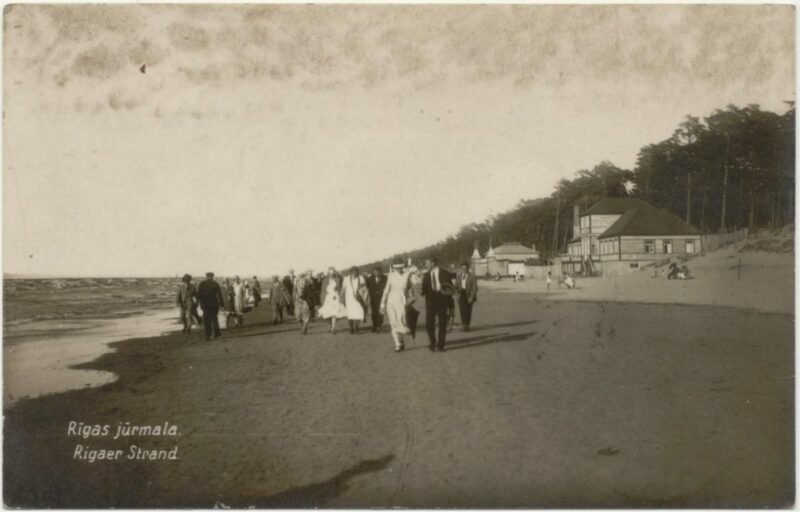 The first ‘beach-station’ of the railwayline from Riga was Bulli, 30 minutes (18 km) from Riga, one of the two stations of Bulduri. Two kilometre away the railway station Bulduri was located on this line. Bulduri had good hotels, sanatoriums, hostels and public houses. In the ‘Kurhaus’ were given symphony concerts. There was a post office opened in 1907. The Latvian post office was opened 21.06.1919. The card above shows the usual Latvian postmark of Bulduri. This postmark is known with two different serial letters, A (with 7 bars) and B (with 9 bars). 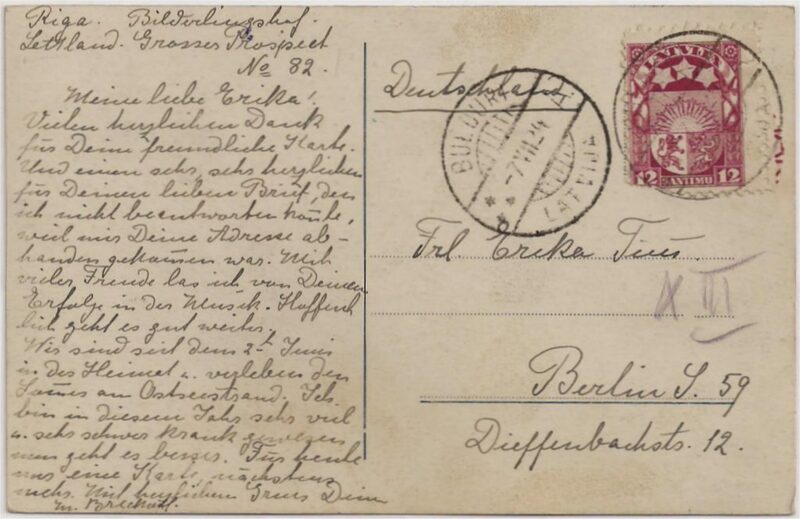 After enlarging with the computer the postmark of this card has serial letter A. The picture-side shows a picture of the beach. 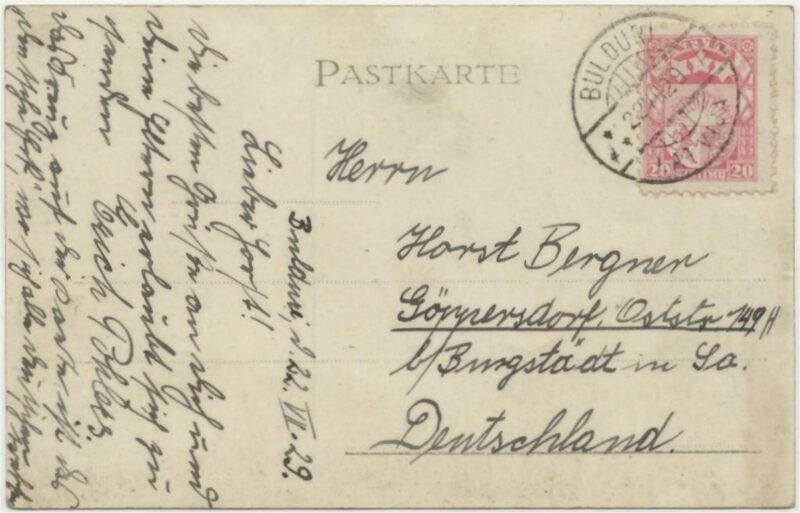 Picture-side of the card from Bulduri to Germany. An older postmark is used with the indication BILDERLIŅI – serial letter a- and in this name is to recognise the old name Bildeeringshof. This type postmark – type 1, according the book of Harry v. Hofmann – has as characteristics: double circle, place at the top, below Latwija, serial letter on the right, ornament left, no bars. Even older are the provisional postnarks (16-7-1919? ), used at the start. In Bulduri is also a single-ring postmark used with the written German indication ‘Bilderingshof’ and a written date. 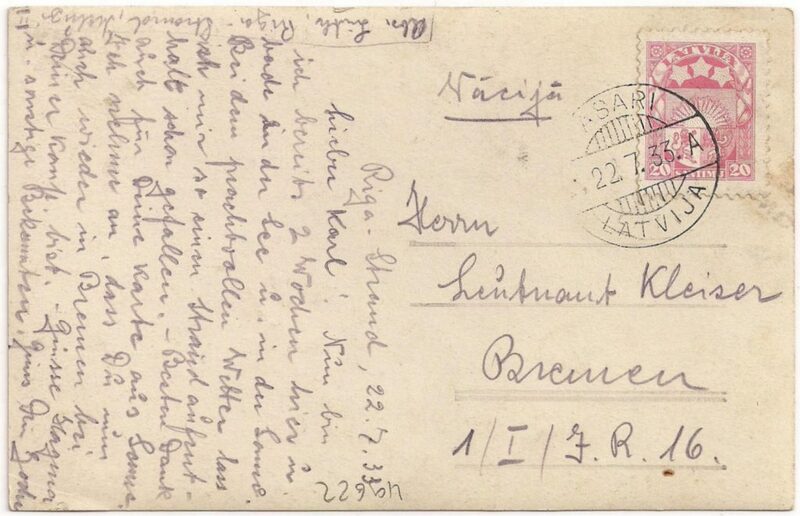 Also a singlering-postmark is used with the written Latvian indication ‘Bilderlini’ and written date. From 30.05.1920 the name of the post-office is Bulduri. Picture postcard with a view from Bulduri. The card is sent from Bulduri. 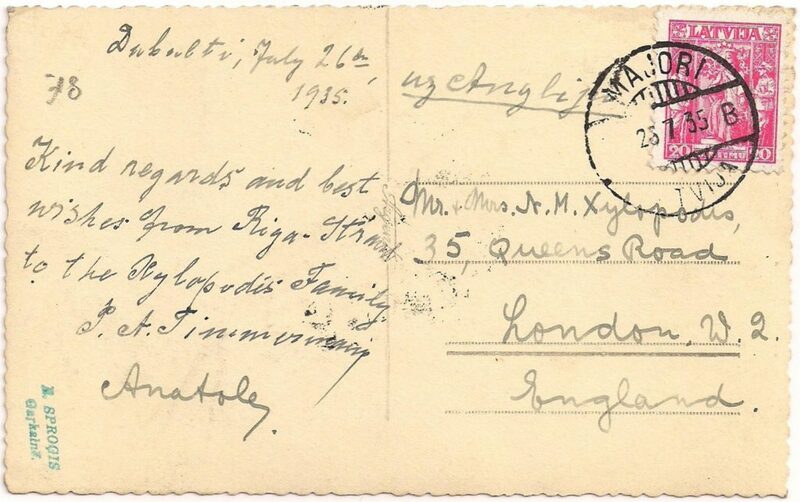 The postmark is not clear, but the card is written in 1927. The card is sent to Czechoslovakia, so 15 s. is the correct rate. Mostly the post from this area are picture postcards, sent by visitors. 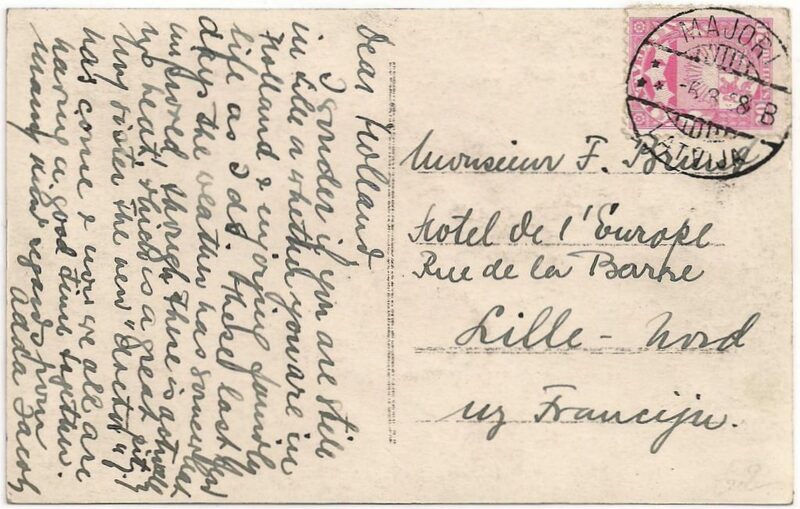 Here below anothe card from Bulduri to Berlin with a nice view of the beach. The picture-side of the card to Berlin. In 1920, from August 6 to September 6, the first ‘Baltic Conference’ is held at Bulduri. It was organized by the Latvians and they invited not only Finland, Estonia, Lithuania and Poland but also the Scandinavian countries. The Scandinavian kingdoms did not answer. The Ukrainians and White Ruthenians arrived uninvited. The Ukrainian representatives were admitted on August 20, but not the White Ruthenians: Soviet Russia might be offended. In this time Soviet troops -two armies- tried to conquer Warsaw. At this time the Lithuanians were again in their old capital Vilnius, but the Poles did not accept this. Estonia and Lithuania had signed their peace treaties with Soviet Russia but Latvia signed hers during the conference, on August 11. Finland still had difficulties with the Russians over Karelia. Proposals for cooperation were postal, telegraph, telephone and railroad conventions, economic cooperation, a convention on civil rights and more. The railwaystation of Majori is over 24 km from Riga. The place, center of the spa life, was also to reach by steamboat from Riga. Even now, in the season – May 1 to September 30, one can make a ride on the steamer between Riga and Majori. Ober Ost post odffice was opened until 26.12.18. Some days they were working together with the Latvian Republic poststation, open 19.12.18 – 05.01.19. Then the Bolshevik period poststation 05.01.19 until some time in late May 1919 (23.05.19 seen). So again Latvian Republic poststation from 14.06.19 but post and telegraph office from 09.04.20. Here a postcard from Majori. In Majori ware used more Latvian standard postmarks: codeletters A and B, both with seven lines in the bars. Furthermore, also postmarks with codeletter C and D are used, each with nine lines in the bars. In the Handbook of Harry v. Hofmann and data of Juris Mors, all these postmarks (codeletter A, B, C, D) are type 6. 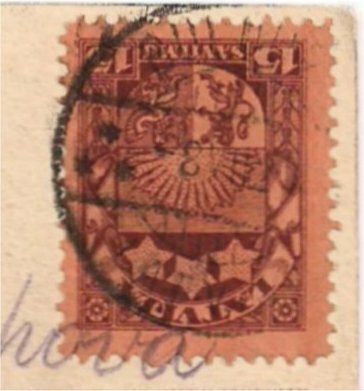 There is also an older type postmark with bars, but with country name at the top with a W, LATWIJA (type 5 in the book of v. Hofmann), but this is not used in Majori. The later type postmark- type 10-, arches without bars, place name at the top and country name below with a V, LATVIJA, codeletter on the right and left three stars (type 10) is used in Majori with codeletter ‘E’ (earlist reported date -5.7.38). According Juris Mors is type 10 with codeletter A very short used in 1942. Melluži, the former Karlsbad, could be reached by two railwaystations, Melluži I and Melluži II, respectively 27,5 and 29 km from Riga. The post office is opened August 25, 1919. The postmark type 6 is used (with bars/lines and V in Latvija) with codeletters A (9 lines), B (9 lines) and C (9 lines). Also type 10 (without bars/lines, V in LATVIJA) is used -late, 1939- with codeletters A and B. There exists also a very scarce postmark of MELLUŽI-STACIJA, type 6 with 9 bars and codeletter A. This post office is opened June 16, 1932 and closed March8, 1941. 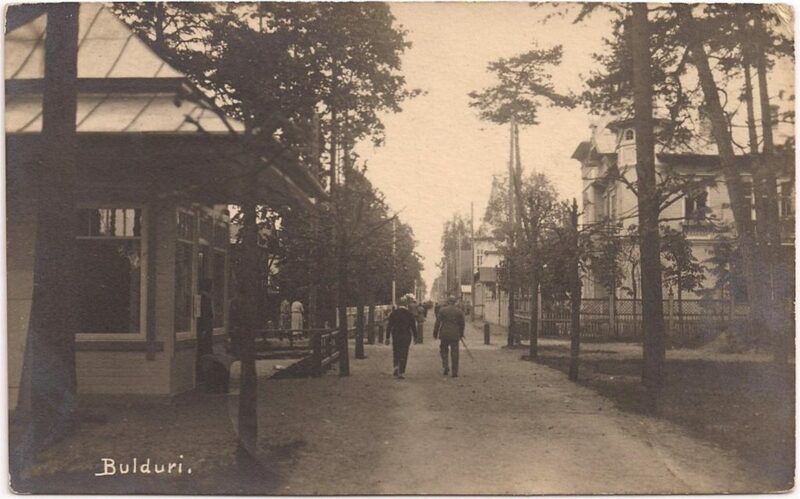 The post office is renamed Pumpuri on 01.04.39. Asari, the former of АССЕРНЪ (ASSERN), is located -as you can see on the map above- in the west of Rigas Jūmala. 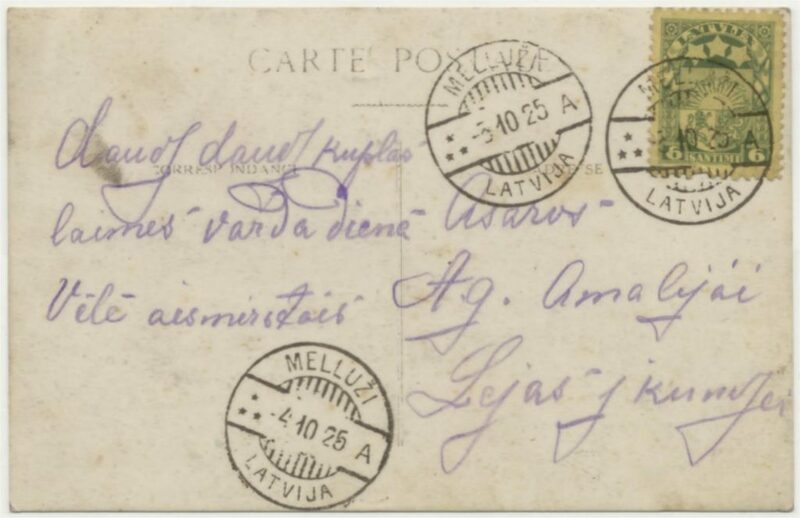 The postmark type 6 is used on this card (with bars/lines and V in Latvija) with codeletter A (9 lines). Also type 10 (without bars/lines, V in LATVIJA) is used in Asari with codeletter A. The post office was open 25.08.1919 – 08.03.1941. On the picture side of this card: a nice view on the beach. 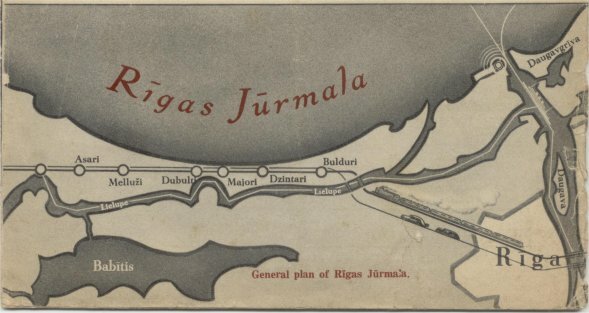 Asari is mentioned in the travel guidefrom about 1928 – Der Rigasche Strand – Baltische Riviera (p. 27): the place had two railway stations, Asari I (30 km from of Riga) and Asari II (32,5 km from Riga). The place couls also be reached by boat: in ‘Valtera muiža’ was a steamer stop on the shore of the river Lielupe, south of Asari. In 1938 when the Asari II railway station was renamed and the name of Vaivari appeared. The present railway station of Asari is an old building: one of the most beautiful of the baltic. Vaivari and Asari stations on a modern map. Russia with Teheran, Port Arthur, and Peking : handbook for travellers / by Karl Baedeker. -A facsimile of th original 1914 edition. - New york : Random House, 1971. - Origal print 1914. 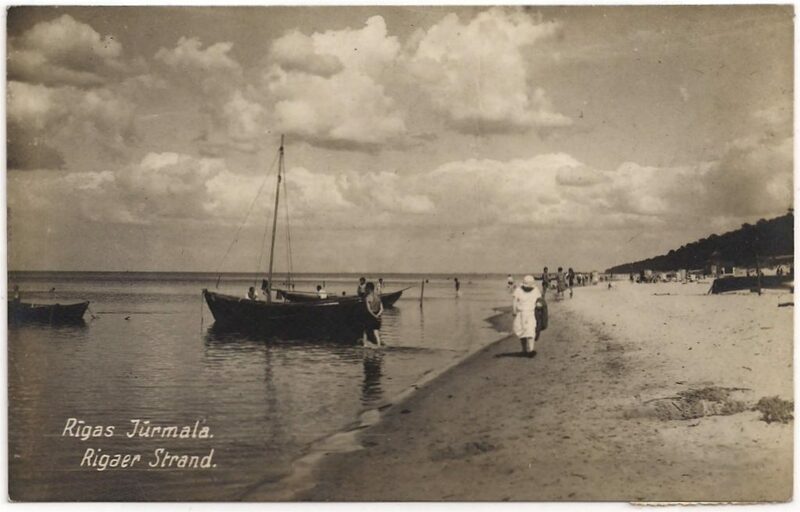 Vadonis pa Rigas Jūrmalas pilsētu = Fūhrer durch den Rigaschen Strand mit Plan. - [1922?]. - 24 p. : krt.. - Bilingual, Latvian and German. A recent (regularly updated) overview of the Latvian postmarks is placed -as pdf-file- on the nice site of 'Latvian Philately' by Juris Mors, also based on v. Hoffmann and other sources..